Introducing the Chanel Leather Deauville Tote Bag. The Deauville Tote Bag was first presented for the brand’s Spring/Summer 2012 Collection and was made of canvas. For Spring/Summer 2016, this chic tote bag is made available in calfskin leather which features a waxy finish. The exterior coating allows the bag to have added durability when traveling. It has silver hadrware and a flat back pocket. It comes in two sizes, Small and Large. It has interlaced chain and leather shoulder strap, the large size also has two top handles. As you may have noticed from the large influx of Chanel pieces here in our community, Chanel’s Cruise 2016 offering is all over the headlines as the collection with one of the most coveted pieces in fashion. And here, we’re going to show you the Deauville Bag Collection – it’s making a comeback for Cruise 2016, and we’re more than happy! These bags are out to impress, alright – we’ve even made a feature on the totes based on the original design. You can click on the link below to read more. What’s fascinating is that these babies now come in multiple styles – you can get the usual tote (that comes in small and large sizes), plus a crossbody and a WOC! The large tote is set to be priced at $2,600 USD, the small tote at $2,100 USD, the crossbody at $1,800 USD and the WOC at $1,400 USD. All of the bags in the collection are made with canvas (a very simple yet resilient material), with interwoven chain links and a large ‘CC’ signature and logo in front (plus the street name of their famous store, 31 Rue Cambon Paris). 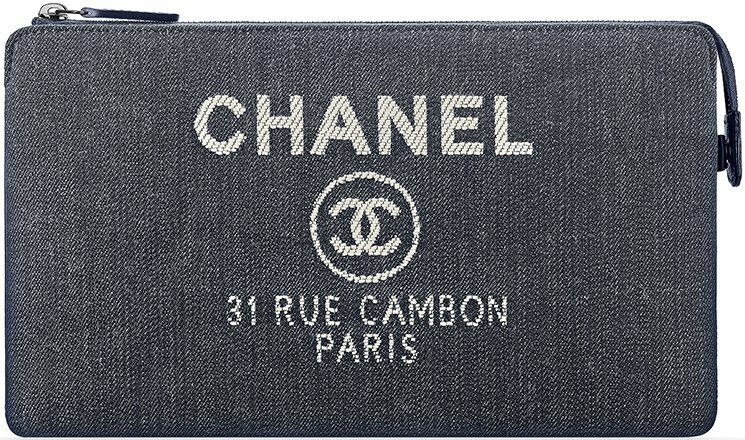 You’re carrying major Chanel history with every piece! Get your very own Chanel Deauville Bag now! Ready for something spectacular from Chanel? Presenting, the Deauville Wallets and Pouches! Simple yet elegant, these babies are out to give you another kind of fashion experience, guaranteed! We just love how inventive this brand gets every season. The Deauville line of totes and bags isn’t new to us – first introduced in the spring and summer 2012 collection, it came in a variety of colors to choose from. Now, we’re seeing a line which includes wallets and pouches to the family – pieces that we’re also dying to have. They still bear the same Chanel CC 31 Rue Cambon signature in front, which only adds to its appeal. You can get your very own Deauville Wallet and Pouches now via Chanel boutique. The Chanel Deauville Canvas Tote Bag was first introduced in the brand’s Spring/Summer 2012 Collection. This year, the tote is back once again for the Cruise 2016 Collection but is now available in a few different styles. Aside from the classic canvas totes which comes in Small and Large, the Deauville line introduces a messenger style with a front flap. This style is also recreated in a WOC for a more casual look featuring the canvas material. The Deauville bags feature the iconic Chanel logo along with the Paris address. Available in three colors, Dark Blue, Pink and Yellow. Available in stores now!